The Insteon ToggleLinc toggle switch is perfect for controlling non-dimming loads and has one of the quietest relays available. It can be used with compact fluorescent, fluorescent, low voltage, halogen and other non-dimming loads. The ToggleLinc looks great and is simple to use. Toggle up for on, down for off. With two way communication, it will send it's status out on the powerline when you use it locally, so that other automated controllers and area controllers can keep track of the status. 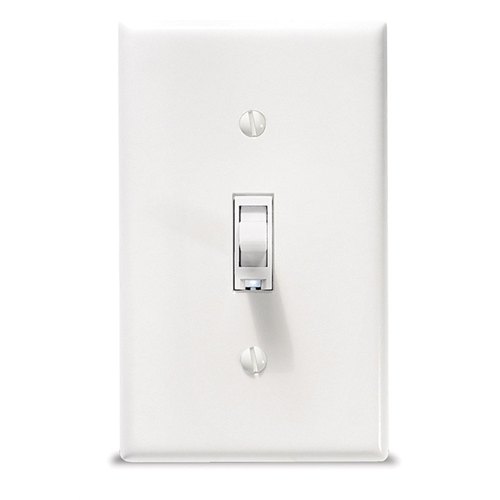 ToggleLinc switches support scenes so you can set up mood or task lighting with a single KeypadLinc button press Insteon command. The ToggleLinc is easy to install, requires only about 2/3 of the space of a standard automated switch and requires a neutral wire to install and function. True toggle style action. White colour. No faceplate included. For multi-way lighting circuits, use multiple ToggleLinc V2 simply connected to load and neutral... no traveller wires!